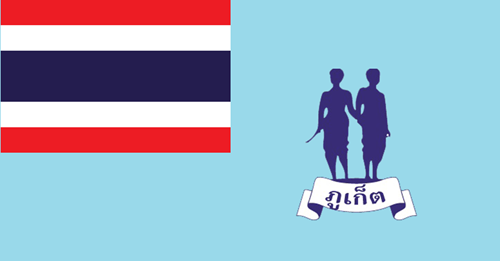 Today is the 13th anniversary of what is known here as either the Boxing Day Tsunami or the Andaman Sea Tsunami. Last year, I wrote an ASAD article about the impact that event had on me personally as well as the island in southern Thailand that became my permanent home afterwards. 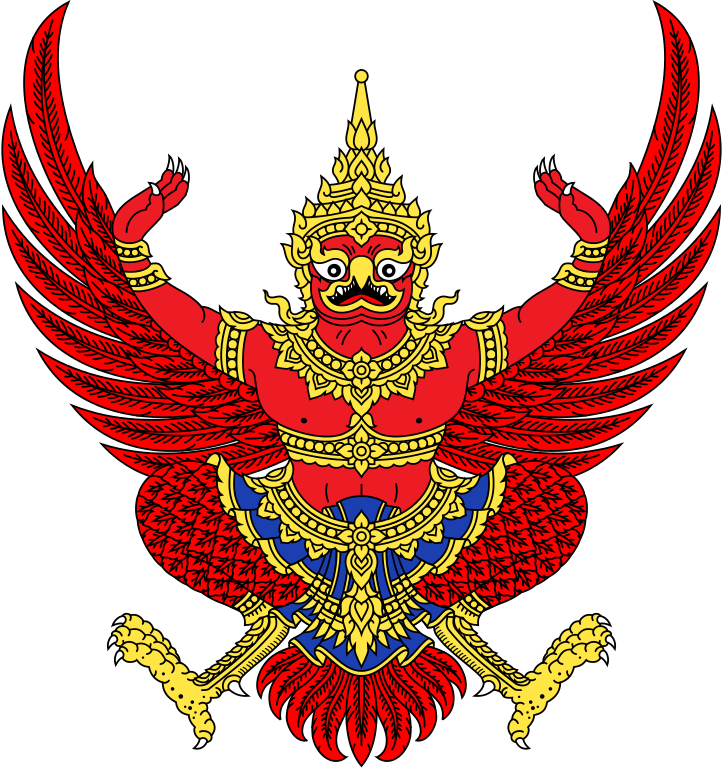 The earthquake that triggered this tsunami occurred at 07:58:53 local Phuket time (GMT +7) on December 26, 2014, with the epicenter off the west coast of Sumatra, Indonesia. The shock had a moment magnitude of 9.1–9.3 and a maximum Mercalli intensity of IX (Violent). The undersea megathrust earthquake was caused when the Indian Plate was subducted by the Burma Plate and triggered a series of devastating tsunamis along the coasts of most landmasses bordering the Indian Ocean, killing 230,000–280,000 people in 14 countries, and inundating coastal communities with waves up to 100 feet (30 meters) high. It was one of the deadliest natural disasters in recorded history. Indonesia was the hardest-hit country, followed by Sri Lanka, India, and Thailand. It is the third-largest earthquake ever recorded on a seismograph and had the longest duration of faulting ever observed, between 8.3 and 10 minutes. It caused the entire planet to vibrate as much as 0.4 inches (1 centimeter) and triggered other earthquakes as far away as Alaska. Map showing the epicenter of the 2004 Boxing Day earthquake and countries affected by the resulting tsunami. 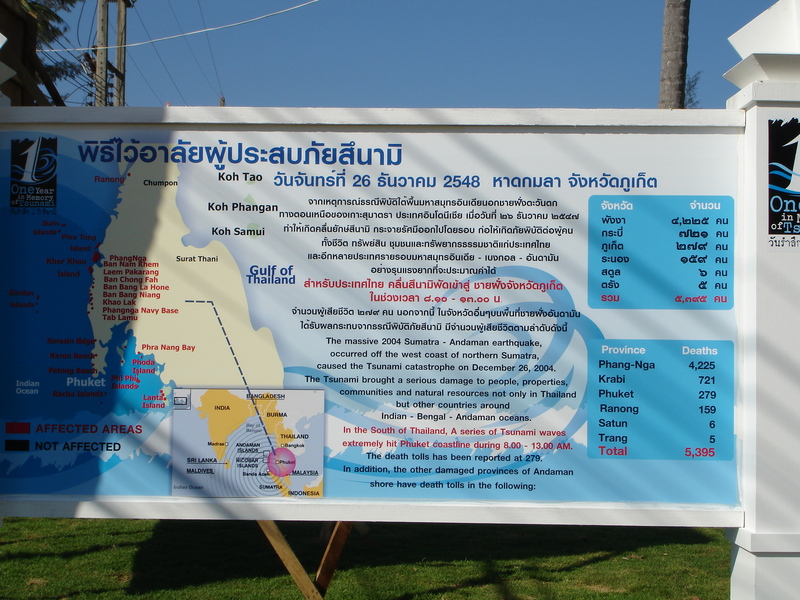 Map showing areas in Phuket and Phang Nga provinces in Thailand affected by the 2004 Boxing Day tsunami. Casualty “totals” are also given although the numbers are vastly under-reported due to the Thai government’s fear of the loss of tourism revenue. To this day, some 13 years later, there is still a large number of names listed as “Missing” rather than “Died” in order to keep the numbers artificially low. 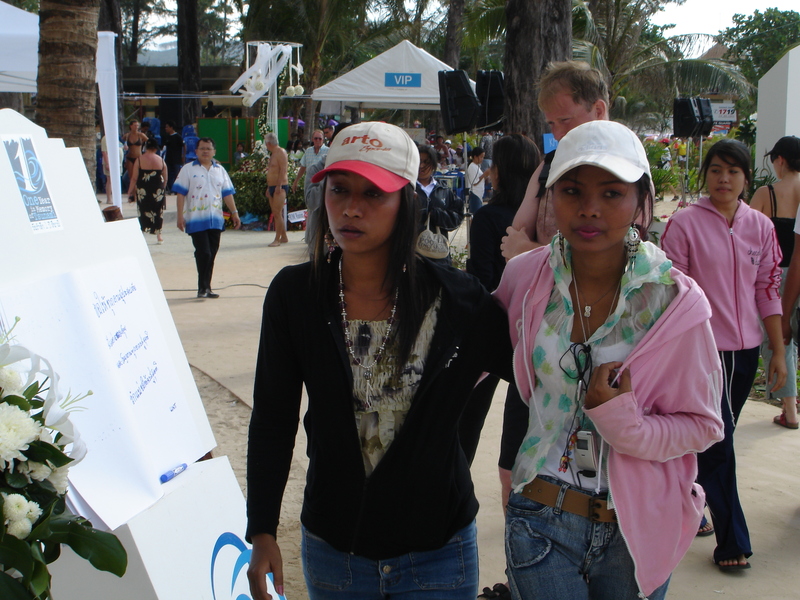 Photo taken by Mark Jochim on Patong Beach, Phuket, on December 24, 2005. A tsunami (from Japanese: 津波, “harbor wave”) or tidal wave, also known as a seismic sea wave, is a series of waves in a water body caused by the displacement of a large volume of water, generally in an ocean or a large lake. Earthquakes, volcanic eruptions and other underwater explosions (including detonations of underwater nuclear devices), landslides, glacier calvings, meteorite impacts and other disturbances above or below water all have the potential to generate a tsunami. Unlike normal ocean waves, which are generated by wind, or tides, which are generated by the gravitational pull of the Moon and the Sun, a tsunami is generated by the displacement of water. Tsunami waves do not resemble normal undersea currents or sea waves, because their wavelength is far longer. Rather than appearing as a breaking wave, a tsunami may instead initially resemble a rapidly rising tide, and for this reason they are often referred to as tidal waves, although this usage is not favored by the scientific community because tsunamis are not tidal in nature. Tsunamis generally consist of a series of waves, with periods ranging from minutes to hours, arriving in a so-called “internal wave train”. Wave heights of tens of meters can be generated by large events. Although the impact of tsunamis is limited to coastal areas, their destructive power can be enormous and they can affect entire ocean basins. Greek historian Thucydides suggested in his late-5th century BC History of the Peloponnesian War, that tsunamis were related to submarine earthquakes, but the understanding of a tsunami’s nature remained slim until the 20th century and much remains unknown. Major areas of current research include trying to determine why some large earthquakes do not generate tsunamis while other smaller ones do; trying to accurately forecast the passage of tsunamis across the oceans; and also to forecast how tsunami waves interact with specific shorelines. Tsunami wave hitting Ao Nang in Krabi Province, Thailand. Photo by David Rydevik (email: david.rydevikgmail.com), Stockholm, Sweden, December 26, 2004. Tsunamis are sometimes referred to as tidal waves. This once-popular term derives from the most common appearance of a tsunami, which is that of an extraordinarily high tidal bore. Tsunamis and tides both produce waves of water that move inland, but in the case of a tsunami, the inland movement of water may be much greater, giving the impression of an incredibly high and forceful tide. In recent years, the term “tidal wave” has fallen out of favor, especially in the scientific community, because tsunamis have nothing to do with tides, which are produced by the gravitational pull of the moon and sun rather than the displacement of water. Although the meanings of “tidal” include “resembling” or “having the form or character of” the tides, use of the term tidal wave is discouraged by geologists and oceanographers. “The Great Wave off Kanagawa” (神奈川沖浪裏 Kanagawa-oki nami ura, “Under a wave off Kanagawa”), also known as The Great Wave or simply The Wave, is a woodblock print by the Japanese ukiyo-e artist Hokusai. It was published sometime between 1829 and 1833 in the late Edo period as the first print in Hokusai’s series “Thirty-six Views of Mount Fuji”. 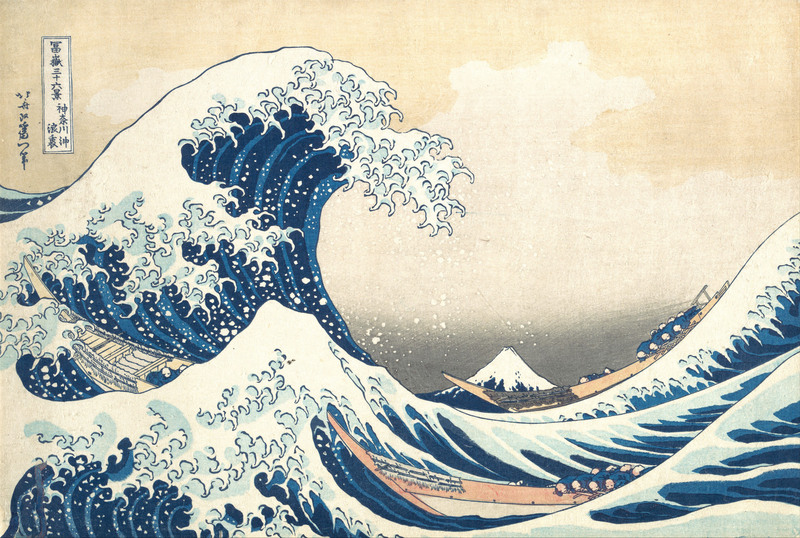 It is Hokusai’s most famous work, and one of the most recognizable works of Japanese art in the world. The image depicts an enormous wave threatening boats off the coast of the town of Kanagawa (the present-day city of Yokohama, Kanagawa Prefecture). While sometimes assumed to be a tsunami, the wave is more likely to be a large rogue wave. As in all the prints in the series, it depicts the area around Mount Fuji under particular conditions, and the mountain itself appears in the background. Impressions of the print are in many Western collections, including the Metropolitan Museum of Art, the British Museum, the Art Institute of Chicago, the Los Angeles County Museum of Art, the National Gallery of Victoria in Melbourne, and in Claude Monet’s home in Giverny, France, among many other collections. While Japan may have the longest recorded history of tsunamis, the sheer destruction caused by the 2004 Boxing Day earthquake and tsunami event mark it as the most devastating of its kind in modern times, killing around 230,000 people. By contrast, the March 11, 2011 earthquake off the Pacific coast of Tōhoku, Japan (東北地方太平洋沖地震 Tōhoku-chihō Taiheiyō Oki Jishin) — at magnitude 9.0-9.1, the most powerful earthquake ever recorded in Japan and the fourth most powerful earthquake in the world since modern record-keeping began in 1900 and the resulting tsunami waves (that reached heights of up to 133 feet or 40.5 meters and traveled up to 6 miles or 10 km) caused 15,894 deaths. The Sumatran region is not unused to tsunamis, with earthquakes of varying magnitudes regularly occurring off the coast of the island. Tsunamis are an often underestimated hazard in the Mediterranean Sea and parts of Europe. Of historical and current (with regard to risk assumptions) importance are the 1755 Lisbon earthquake and tsunami (which was caused by the Azores–Gibraltar Transform Fault), the 1783 Calabrian earthquakes, each causing several tens of thousands of deaths and the 1908 Messina earthquake and tsunami. The tsunami claimed more than 123,000 lives in Sicily and Calabria and is among the most deadly natural disasters in modern Europe. The Storegga Slide in the Norwegian sea and some examples of tsunamis affecting the British Isles refer to landslide and meteotsunamis predominantly and less to earthquake-induced waves. 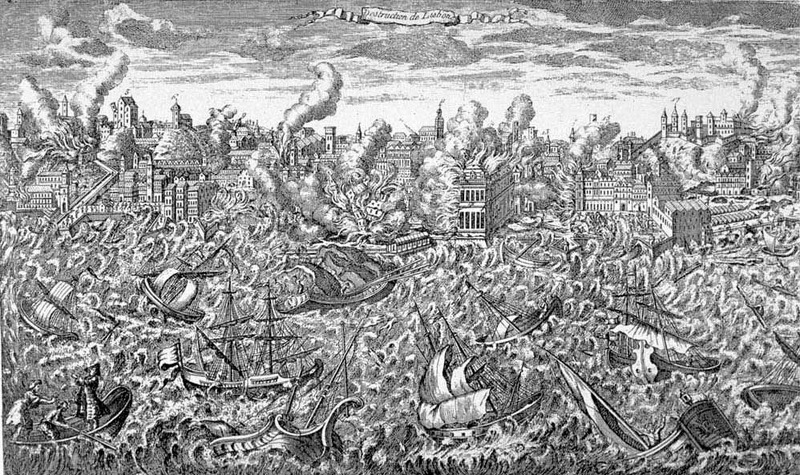 Lisbon, Portugal, during the great earthquake of November 1, 1755. This copper engraving, made that year, shows the city in ruins and in flames. Tsunamis rush upon the shore, destroying the wharfs. The engraving is also noteworthy in showing highly disturbed water in the harbor, which sank many ships. Passengers in the left foreground show signs of panic. Original in: Museu da Cidade, Lisbon. Reproduced in: O Terramoto de 1755, Testamunhos Britanicos = The Lisbon Earthquake of 1755, British Accounts. Lisbon: British Historical Society of Portugal, 1990. The Roman historian Ammianus Marcellinus described the typical sequence of a tsunami, including an incipient earthquake, the sudden retreat of the sea and a following gigantic wave, after the 365 AD tsunami devastated Alexandria. The principal generation mechanism (or cause) of a tsunami is the displacement of a substantial volume of water or perturbation of the sea. This displacement of water is usually attributed to either earthquakes, landslides, volcanic eruptions, glacier calvings or more rarely by meteorites and nuclear tests. The waves formed in this way are then sustained by gravity. Tsunami can be generated when the sea floor abruptly deforms and vertically displaces the overlying water. Tectonic earthquakes are a particular kind of earthquake that are associated with the Earth’s crustal deformation; when these earthquakes occur beneath the sea, the water above the deformed area is displaced from its equilibrium position. More specifically, a tsunami can be generated when thrust faults associated with convergent or destructive plate boundaries move abruptly, resulting in water displacement, owing to the vertical component of movement involved. Movement on normal (extensional) faults can also cause displacement of the seabed, but only the largest of such events (typically related to flexure in the outer trench swell) cause enough displacement to give rise to a significant tsunami, such as the 1977 Sumba and 1933 Sanriku events. Tsunamis have a small amplitude (wave height) offshore, and a very long wavelength (often hundreds of kilometers long, whereas normal ocean waves have a wavelength of only 30 or 40 meters), which is why they generally pass unnoticed at sea, forming only a slight swell usually about 12 inches (300 millimeters) above the normal sea surface. They grow in height when they reach shallower water, in a wave shoaling process described below. A tsunami can occur in any tidal state and even at low tide can still inundate coastal areas. On April 1, 1946, the magnitude 8.6 Aleutian Islands earthquake occurred with a maximum Mercalli intensity of VI (Strong). It generated a tsunami which inundated Hilo on the island of Hawaii with a 46-foot high (14-meter) surge. Between 165 and 173 were killed. The area where the earthquake occurred is where the Pacific Ocean floor is subducting (or being pushed downwards) under Alaska. Examples of tsunami originating at locations away from convergent boundaries include Storegga about 8,000 years ago, Grand Banks 1929, Papua New Guinea 1998 (Tappin, 2001). The Grand Banks and Papua New Guinea tsunamis came from earthquakes which destabilized sediments, causing them to flow into the ocean and generate a tsunami. They dissipated before travelling transoceanic distances. The cause of the Storegga sediment failure is unknown. Possibilities include an overloading of the sediments, an earthquake or a release of gas hydrates (methane etc.). The 1960 Valdivia earthquake (magnitude 9.5), 1964 Alaska earthquake (Mw 9.2), 2004 Indian Ocean earthquake (Mw 9.2), and 2011 Tōhoku earthquake (Me 9.0) are recent examples of powerful megathrust earthquakes that generated tsunamis (known as teletsunamis) that can cross entire oceans. Smaller (Mw 4.2) earthquakes in Japan can trigger tsunamis (called local and regional tsunamis) that can only devastate nearby coasts, but can do so in only a few minutes. 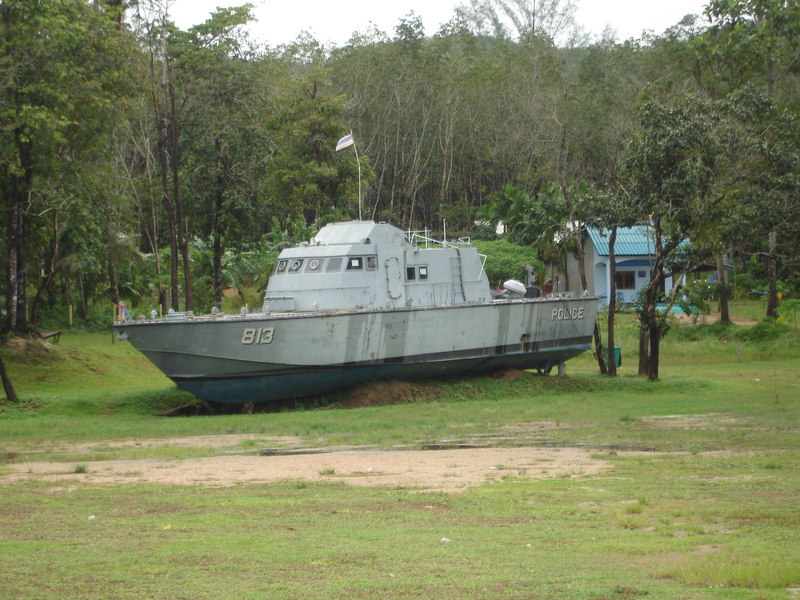 Thai Royal Navy patrol boat 813 was stranded almost 2 km inland at Bang Niang, Khao Lak in Phang Nga Province, Thailand, by the 2004 Boxing Day tsunami. Photos by Mark Jochim on September 30, 2006. In the 1950s, it was discovered that larger tsunamis than had previously been believed possible could be caused by giant submarine landslides. These rapidly displace large water volumes, as energy transfers to the water at a rate faster than the water can absorb. Their existence was confirmed in 1958, when a giant landslide in Lituya Bay, Alaska, caused the highest wave ever recorded, which had a height of over 1700 feet (524 meters) The wave did not travel far, as it struck land almost immediately. Two people fishing in the bay were killed, but another boat managed to ride the wave. Another landslide-tsunami event occurred in 1963 when a massive landslide from Monte Toc entered the Vajont Dam in Italy. The resulting wave surged over the 860 feet (262 m) high dam by 820 feet (250 m) and destroyed several towns. Around 2,000 people died. Scientists named these waves megatsunamis. Some geologists claim that large landslides from volcanic islands, e.g. Cumbre Vieja on La Palma in the Canary Islands, may be able to generate megatsunamis that can cross oceans, but this is disputed by many others. In general, landslides generate displacements mainly in the shallower parts of the coastline, and there is conjecture about the nature of large landslides that enter water. This has been shown to subsequently affect water in enclosed bays and lakes, but a landslide large enough to cause a transoceanic tsunami has not occurred within recorded history. Susceptible locations are believed to be the Big Island of Hawaii, Fogo in the Cape Verde Islands, La Reunion in the Indian Ocean, and Cumbre Vieja on the island of La Palma in the Canary Islands; along with other volcanic ocean islands. This is because large masses of relatively unconsolidated volcanic material occurs on the flanks and in some cases detachment planes are believed to be developing. However, there is growing controversy about how dangerous these slopes actually are. 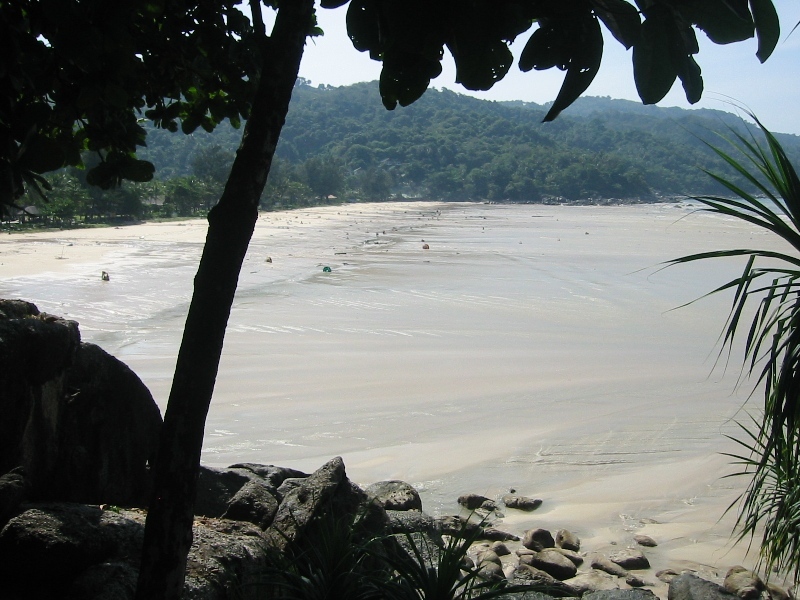 Maximum recession of tsunami waters at Kata Noi Beach, Phuket, Thailand, before the third, and strongest, tsunami wave (sea visible in the right corner). Photo taken by Wikipedia user “Per Honor et Gloria” at 12:43 pm, December 26, 2004. Some meteorological conditions, especially rapid changes in barometric pressure, as seen with the passing of a front, can displace bodies of water enough to cause trains of waves with wavelengths comparable to seismic tsunamis, but usually with lower energies. These are essentially dynamically equivalent to seismic tsunamis, the only differences being that meteotsunamis lack the transoceanic reach of significant seismic tsunamis, and that the force that displaces the water is sustained over some length of time such that meteotsunamis can’t be modelled as having been caused instantaneously. In spite of their lower energies, on shorelines where they can be amplified by resonance they are sometimes powerful enough to cause localized damage and potential for loss of life. They have been documented in many places, including the Great Lakes, the Aegean Sea, the English Channel, and the Balearic Islands, where they are common enough to have a local name, rissaga. In Sicily they are called marubbio and in Nagasaki Bay they are called abiki. Some examples of destructive meteotsunamis include March 31, 1979, at Nagasaki and June 15, 2006 at Menorca, the latter causing damage in the tens of millions of euros. Meteotsunamis should not be confused with storm surges, which are local increases in sea level associated with the low barometric pressure of passing tropical cyclones, nor should they be confused with setup, the temporary local raising of sea level caused by strong on-shore winds. Storm surges and setup are also dangerous causes of coastal flooding in severe weather but their dynamics are completely unrelated to tsunami waves. They are unable to propagate beyond their sources, as waves do. 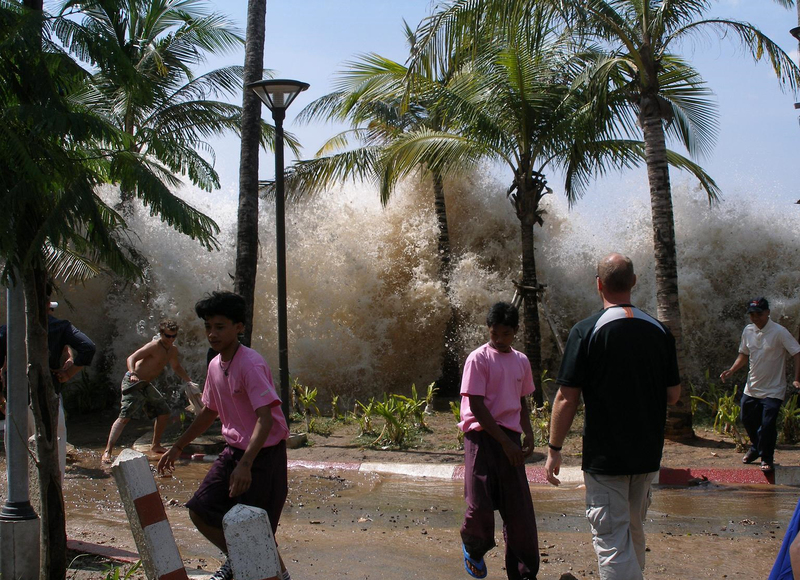 Arrival of the second wave on the west coast of Phuket, Thailand, during the Boxing Day tsunami, December 26, 2004. There have been studies of the potential of the induction of and at least one actual attempt to create tsunami waves as a tectonic weapon. In World War II, the New Zealand Military Forces initiated Project Seal, which attempted to create small tsunamis with explosives in the area of today’s Shakespear Regional Park; the attempt failed. There has been considerable speculation on the possibility of using nuclear weapons to cause tsunamis near an enemy coastline. Even during World War II consideration of the idea using conventional explosives was explored. Nuclear testing in the Pacific Proving Ground by the United States seemed to generate poor results. Operation Crossroads fired two 20 kilotons of TNT (84 TJ) bombs, one in the air and one underwater, above and below the shallow (160 feet or 50 meters) waters of the Bikini Atoll lagoon. Fired about 3.7 miles (6 km) from the nearest island, the waves there were no higher than 9.8-13.1 feet (3–4 m) upon reaching the shoreline. Other underwater tests, mainly Hardtack I/Wahoo (deep water) and Hardtack I/Umbrella (shallow water) confirmed the results. Analysis of the effects of shallow and deep underwater explosions indicate that the energy of the explosions doesn’t easily generate the kind of deep, all-ocean waveforms which are tsunamis; most of the energy creates steam, causes vertical fountains above the water, and creates compressional waveforms Tsunamis are hallmarked by permanent large vertical displacements of very large volumes of water which do not occur in explosions. Tsunamis cause damage by two mechanisms: the smashing force of a wall of water travelling at high speed, and the destructive power of a large volume of water draining off the land and carrying a large amount of debris with it, even with waves that do not appear to be large. While everyday wind waves have a wavelength (from crest to crest) of about 330 feet (100 m) and a height of roughly 6.6 feet (2 m), a tsunami in the deep ocean has a much larger wavelength of up to 120 miles (200 km). Such a wave travels at well over 400 miles per hour (800 kilometers per hour), but owing to the enormous wavelength the wave oscillation at any given point takes 20 or 30 minutes to complete a cycle and has an amplitude of only about 3.3 feet (1 m). This makes tsunamis difficult to detect over deep water, where ships are unable to feel their passage. 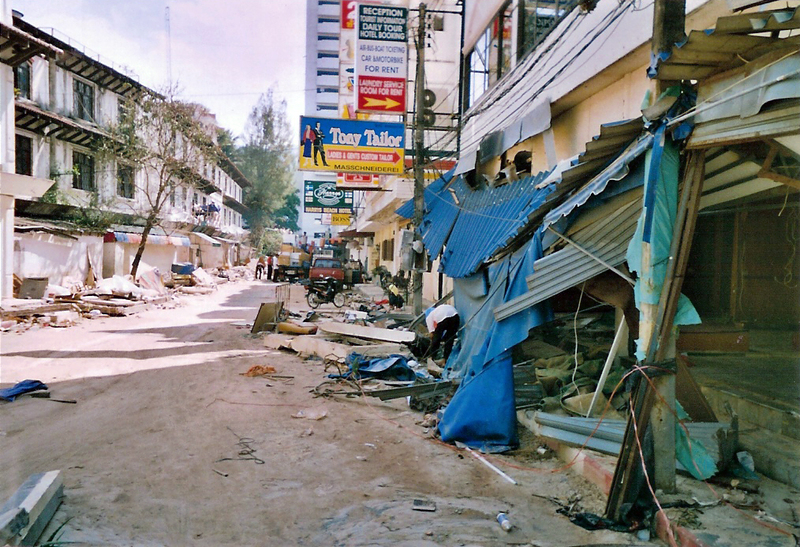 Devastation in the community of Patong on the west coast of Phuket, Thailand, following the 2004 Boxing Day tsunami. 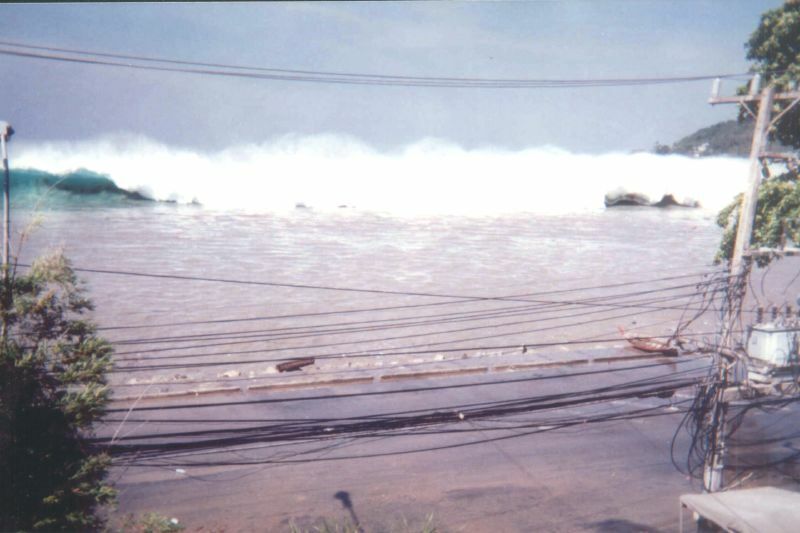 The waves traveled up the numerous narrow lanes (called soi) leading eastward, perpendicular to the beach, causing extensive damage to this tourist-oriented town. Photo taken by Vencel Milei in December 2004. The velocity of a tsunami can be calculated by obtaining the square root of the depth of the water in meters multiplied by the acceleration due to gravity (approximated to 10 m/s2). For example, if the Pacific Ocean is considered to have a depth of 5000 meters, the velocity of a tsunami would be the square root of √(5000 × 10) = √50000 = ~224 meters per second (735 feet per second), which equates to a speed of ~806 kilometers per hour or about 500 miles per hour. This formula is the same as used for calculating the velocity of shallow waves, because a tsunami behaves like a shallow wave as it peak to peak value reaches from the floor of the ocean to the surface. The reason for the Japanese name “harbor wave” is that sometimes a village’s fishermen would sail out, and encounter no unusual waves while out at sea fishing, and come back to land to find their village devastated by a huge wave. As the tsunami approaches the coast and the waters become shallow, wave shoaling compresses the wave and its speed decreases below 50 miles per hour (80 km/h). Its wavelength diminishes to less than 12 miles (20 km) and its amplitude grows enormously — in accord with Green’s law. Since the wave still has the same very long period, the tsunami may take minutes to reach full height. Except for the very largest tsunamis, the approaching wave does not break, but rather appears like a fast-moving tidal bore. Open bays and coastlines adjacent to very deep water may shape the tsunami further into a step-like wave with a steep-breaking front. When the tsunami’s wave peak reaches the shore, the resulting temporary rise in sea level is termed run up. Run up is measured in meters above a reference sea level. A large tsunami may feature multiple waves arriving over a period of hours, with significant time between the wave crests. The first wave to reach the shore may not have the highest run up. All waves have a positive and negative peak; that is, a ridge and a trough. In the case of a propagating wave like a tsunami, either may be the first to arrive. If the first part to arrive at shore is the ridge, a massive breaking wave or sudden flooding will be the first effect noticed on land. However, if the first part to arrive is a trough, a drawback will occur as the shoreline recedes dramatically, exposing normally submerged areas. Drawback can exceed hundreds of meters, and people unaware of the danger sometimes remain near the shore to satisfy their curiosity or to collect fish from the exposed seabed. 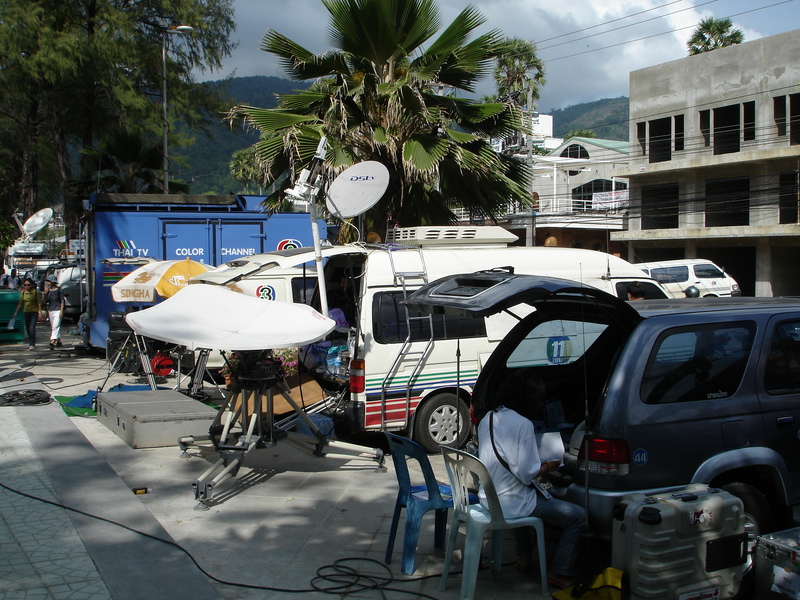 Media coverage in the aftermath of the 2004 Boxing Day tsunami was intense and had yet to diminish even on the first anniversary of the disaster while Phuket, Thailand, still attempted to cleanup and rebuild. Photo taken by Mark Jochim on December 26, 2005. A typical wave period for a damaging tsunami is about twelve minutes. Thus, the sea recedes in the drawback phase, with areas well below sea level exposed after three minutes. For the next six minutes, the wave trough builds into a ridge which may flood the coast, and destruction ensues. During the next six minutes, the wave changes from a ridge to a trough, and the flood waters recede in a second drawback. Victims and debris may be swept into the ocean. The process repeats with succeeding waves. Drawbacks can serve as a brief warning. People who observe drawback (many survivors report an accompanying sucking sound), can survive only if they immediately run for high ground or seek the upper floors of nearby buildings. In 2004, ten-year-old Tilly Smith of Surrey, England, was on Mai Khao Beach in Phuket, Thailand with her parents and sister, and having learned about tsunamis recently in school, told her family that a tsunami might be imminent. Her parents warned others minutes before the wave arrived, saving dozens of lives. She credited her geography teacher, Andrew Kearney. In the 2004 Boxing Day Tsunami, drawback was not reported on the African coast or any other east-facing coasts that it reached. This was because the wave moved downwards on the eastern side of the fault line and upwards on the western side. The western pulse hit coastal Africa and other western areas. A tsunami cannot be precisely predicted, even if the magnitude and location of an earthquake is known. Geologists, oceanographers, and seismologists analyze each earthquake and based on many factors may or may not issue a tsunami warning. However, there are some warning signs of an impending tsunami, and automated systems can provide warnings immediately after an earthquake in time to save lives. One of the most successful systems uses bottom pressure sensors, attached to buoys, which constantly monitor the pressure of the overlying water column. Regions with a high tsunami risk typically use tsunami warning systems to warn the population before the wave reaches land. On the west coast of the United States, which is prone to Pacific Ocean tsunami, warning signs indicate evacuation routes. In Japan, the community is well-educated about earthquakes and tsunamis, and along the Japanese shorelines the tsunami warning signs are reminders of the natural hazards together with a network of warning sirens, typically at the top of the cliff of surroundings hills. The Pacific Tsunami Warning System is based in Honolulu, Hawaii. It monitors Pacific Ocean seismic activity. A sufficiently large earthquake magnitude and other information triggers a tsunami warning. While the subduction zones around the Pacific are seismically active, not all earthquakes generate tsunami. Computers assist in analyzing the tsunami risk of every earthquake that occurs in the Pacific Ocean and the adjoining land masses. 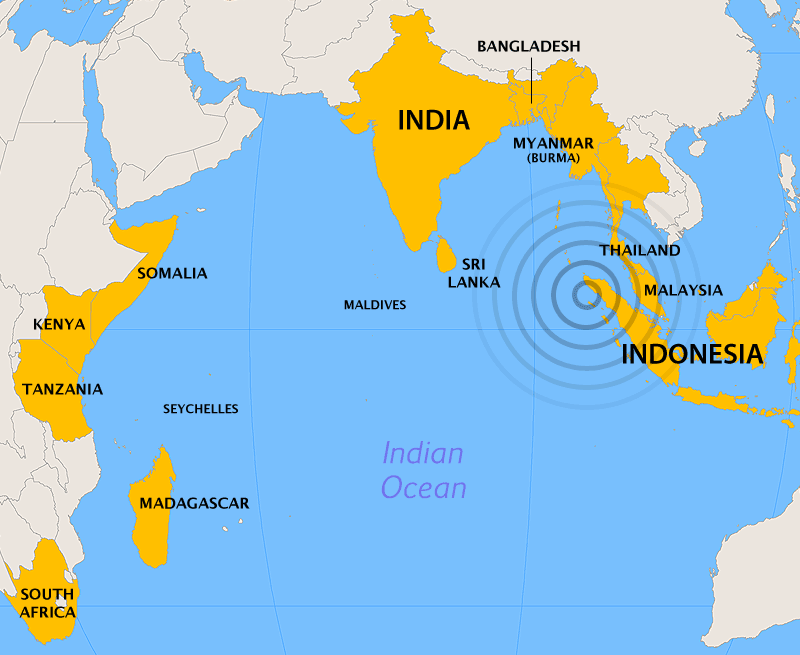 As a direct result of the Indian Ocean tsunami, a re-appraisal of the tsunami threat for all coastal areas is being undertaken by national governments and the United Nations Disaster Mitigation Committee. A tsunami warning system was installed in the Indian Ocean. Computer models can predict tsunami arrival, usually within minutes of the arrival time. Bottom pressure sensors can relay information in real time. Based on these pressure readings and other seismic information and the seafloor’s shape (bathymetry) and coastal topography, the models estimate the amplitude and surge height of the approaching tsunami. All Pacific Rim countries collaborate in the Tsunami Warning System and most regularly practice evacuation and other procedures. In Japan, such preparation is mandatory for government, local authorities, emergency services and the population. Some zoologists hypothesize that some animal species have an ability to sense subsonic Rayleigh waves from an earthquake or a tsunami. If correct, monitoring their behavior could provide advance warning of earthquakes, tsunami etc. However, the evidence is controversial and is not widely accepted. There are unsubstantiated claims about the Lisbon quake that some animals escaped to higher ground, while many other animals in the same areas drowned. The phenomenon was also noted by media sources in Sri Lanka and Thailand following the 2004 Boxing Day earthquake. It is possible that certain animals (e.g., elephants) may have heard the sounds of the tsunami as it approached the coast. The elephants’ reaction was to move away from the approaching noise. 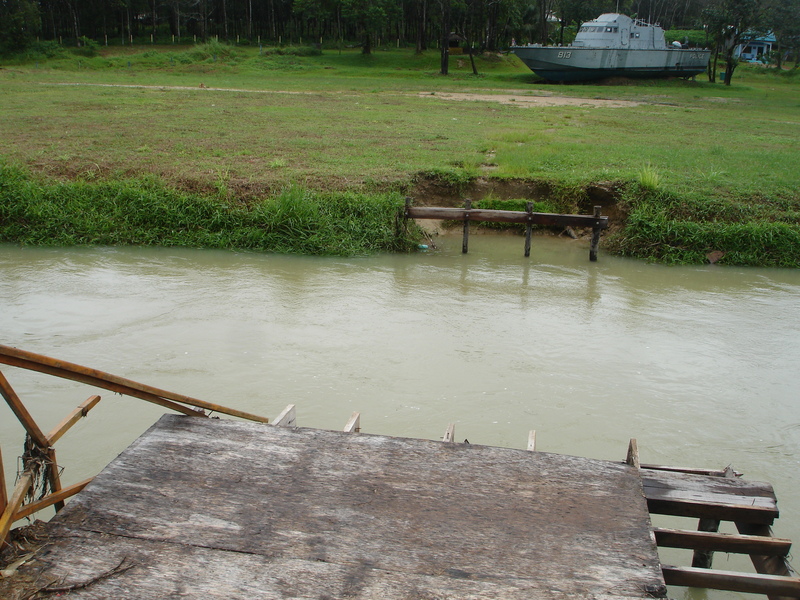 By contrast, some humans went to the shore to investigate and many drowned as a result. Along the United States west coast, in addition to sirens, warnings are sent on television and radio via the National Weather Service, using the Emergency Alert System. 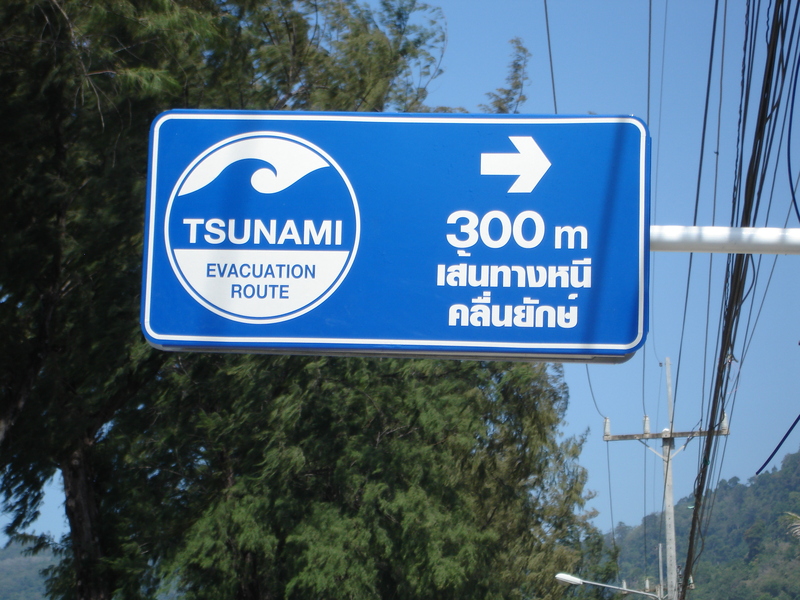 Tsunami Evacuation Route sign near Loma Park on Patong Beach, Phuket, Thailand. Photo taken by Mark Jochim on December 24, 2005. 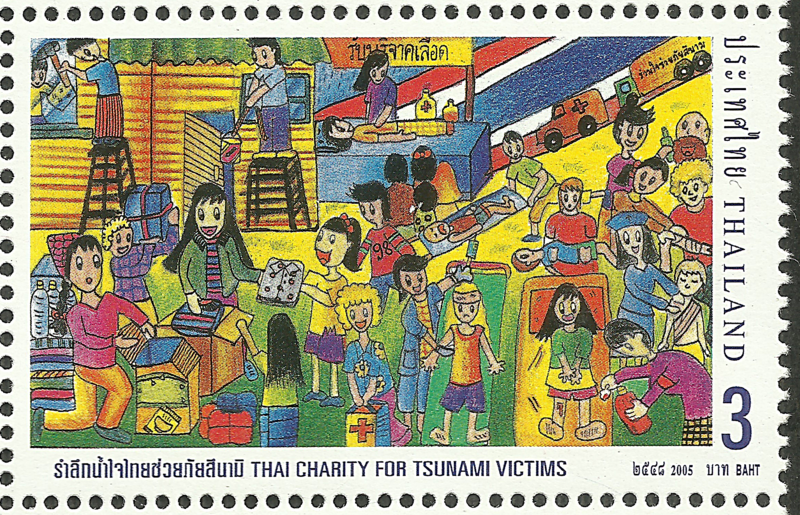 Several nations including Thailand, Indonesia, Sri Lanka, China, France, San Marino, Belgium, and Slovakia released stamps marking the 2004 Boxing Day tsunami. Most of these were issued as semi-postal charity stamps to raise money for various organizations providing relief to the victims of the disaster. 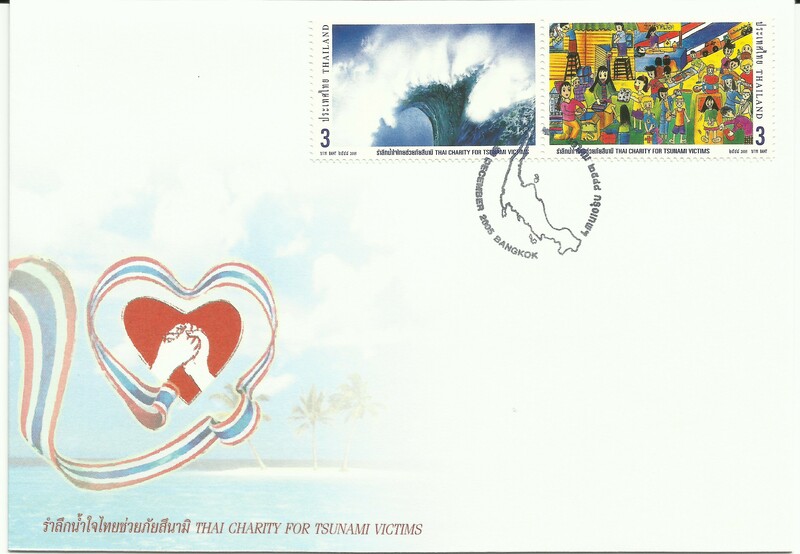 Indonesia’s stamp received an ASAD article on March 1, 2017, and I featured one-half of Thailand’s se-tenant issue on last year’s tsunami anniversary. 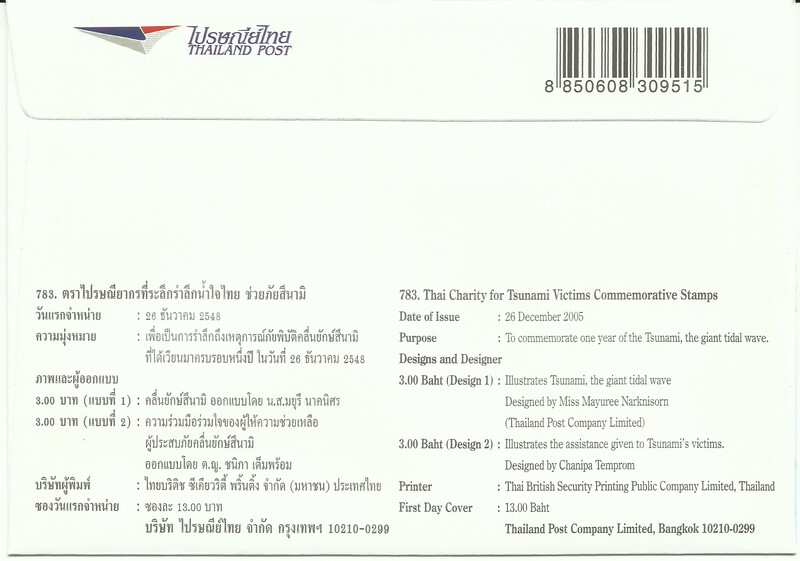 Thailand Post released two general issue tsunami commemorative stamps on December 26, 2005. 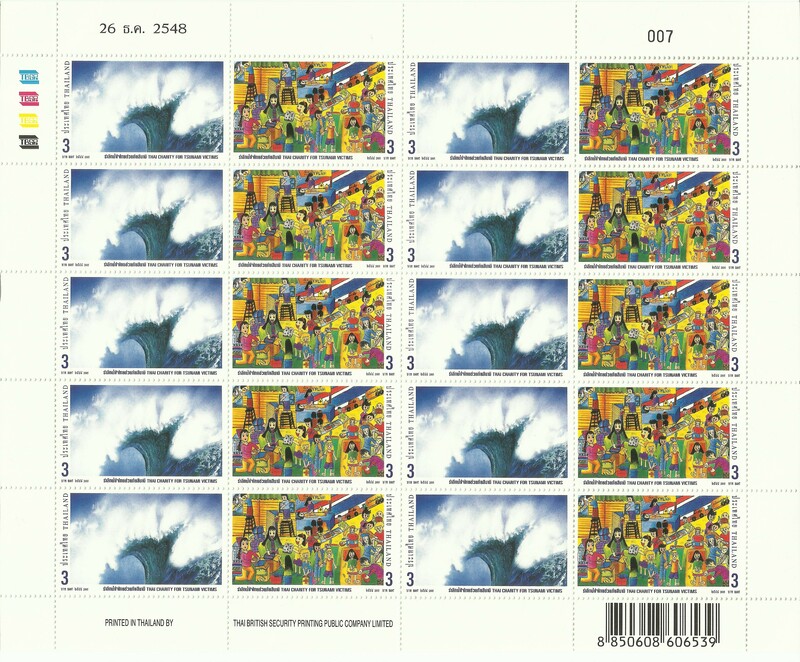 The Scott stamp catalogue gives the release one number listing (Scott #2211) and the individual stamps each have a sub-number: Scott #2211a portrays a painting simply entitled “Wave” by Mayuree Narkisorn while Scott #2211b a child’s drawing entitled “Undivided Kindness of Thai People” by then-student Chanipa Themprom. The 3-baht stamps were printed by Thai British Security Printing Public Company Ltd. using the lithography process on granite paper and issued in panes of 20 stamps (10 of each design), perforated 14½x14.